Keep an eye on which players visit the 49ers before the draft. Every year, every NFL team can host and interview up to 30 draft-eligible players at the team’s facility. Of those 30 players, the 49ers probably will draft two or three. In 2018, the 49ers hosted pre-draft visits in Santa Clara for wide receiver Dante Pettis and middle linebacker Fred Warner before drafting Pettis in Round 2 and Warner in Round 3. And in 2017, the 49ers hosted weak-side linebacker Reuben Foster, cornerback Ahkello Witherspoon, tight end George Kittle and quarterback Nick Mullens. Then, the 49ers drafted Foster in Round 1, Witherspoon in Round 3, Kittle in Round 5 and signed Mullens as an undrafted free agent. This year, the list of players who will come to Santa Clara and meet the 49ers before the April 25-27 draft has begun to trickle out on the internet and in published reports. 31 days, 18 hours, 39 minutes! I still favor Allen over Bosa. I am suspicious of Bosa’s work ethic and diligence given his performance in Ohio. Is he a prima donna? Give me Allen or Willimans. Williams maybe, Allen no. Burns>Allen. Why even bother with Gary? He is the Classic, looks like Tarzan plays like Jane player. Yes, he has the best Athlete/Body combo of anyone in the draft. The problem is while in terms of athleticism he’s a top 3 pick, if his measurables were the same as Josh Allen or Nick Bosa’s he’s probably 4th rounder. His 3-year career numbers are pretty good, if they were done in 1 season. *Josh Allen put together better numbers in 1 year than Gary did in his 3-year career at Michigan. For amateurs like ourselves, simply looking at his production might make sense. However, when you have a player of uncanny ability who did not produce like expected, you have to ask why? Was it the scheme and what they asked him to do. I doubt Harbaugh runs a defense that let’s DE/DT’s pin their ears back. Probably, a bit conservative. Is it his motor/drive? Again, don’t know. That is why the Niners should interview him. If we trade down, we need to make sure we are no passing on the next Reggie White. I agree with this when the production is simply not up to expectations, but his production was below average in college football. Simply put, Sack wise (and to be fair this is low hanging fruit) there were more than 200 players that out produced him last year (including multiple db’s). Back when I coached youth football, we used to call those guys that looked great in pads but weren’t very good football players ‘coach killers.’ Every year guys would look at a kids size and speed and draft the most athletic looking guys without knowing if they could play. I remember one kid in particular whose Dad played in the NFL so you would think he could play football but he absolutely hated contact. Kid was drafted in the 1st round by a coach who just didn’t know about him. I always drafted kids who ran hard and initiated contact and I’d try to get top end speed if I could find it. We played the NFL son’s team and the coach had him at Mike. We ran plays right at the kid and by the 3rd quarter the kid was literally running to get out of the way of the blocker or ball carrier. I wouldn’t say Gary is a coach killer but it seems like he’s living on his reputation more than his production. Honestly, I wouldn’t pick him before #20. His freaky size, speed, quickness combo makes him intriguing, but in the second round. He is a HUGE risk if taken in the top 10. “it is not clear where Gary likes to dine”. Priceless. Maybe Paraag has an analytic algorithm for that. The player with the highest upside may be Gary. Coming out of college, he was compared to Reggie White. He has that type of athleticism. Why didn’t he produce more? Not clear. Maybe it was the scheme. Regardless, if the niners trade down 3 or 4 spots, they may see his upside as too great to pass up. Which ever guy they choose people will disect and ultimately scrutinize. I hope its Allen for the fact that we need speed on defense to keep up with these new college offenses that teams are starting to use. @Omarz,yes they should pick Allen,he played in the toughest conference in college football,the SEC which has more talent then anybody…Bosa is a Bust waiting to happen,to me i just don’t trust a guy whose goal is to quit on a team so he can get ready for the draft,red-flag sounds like a me-guy. James, thats what im thinking of Bosa too, I remember people where talking about Marcus Vick was gonna be another Mike Vick or better (didnt happen). Only was talked about because of his older brother. Joey Bosa is good but when he plays other than that he’s always hurt. DeAngelo Hall says the 49ers should take Bosa! Reggie Bush says they should take Allen. I don’t think Allen was ever a consideration with the #2 pick. Did I sleep longer then I realize? Nah, but I believe it’s been a two horse race all along. Ihop vs. Paul Bunyan’s Cupboard. Niners fans say they should take Bosa in a lopsided opinion! It’s not rocket science. This is one of the easiest picks ShanaLynch will ever get! *Barring the Cardinals taking him or a brobdingnagian** trade offer. **For the Vicar of Verbosity, Sebbers! It’s NICK BOSA for the WIN! Too much damage has been done for Rosen to stick around AZ. Murray will be their pick. Niners will take Bosa. Done deal if he is there. Yea I really dont know if Bosa should be the guy…Then again hes almost a sure thing if he proves durable? I do think Josh Allen has a ton of room for growth, as does Williams and DK Metcalf. Metcalf, in particular, is not liked by 49er fans but has an incredibly high ceiling. Somehow his catch radius, strength, and leaping ability go overlooked. If he somehow slides to the middle of the 1st, I’ll be rooting for a trade up. Will Frank Gore give Verrett permission to wear #21, and should he? At some point all numbers will need to come out of retirement but this is too soon if you ask me. Did Frank get Deion’s permission to wear #21? Frank’s not on the team, still playing, and hasn’t had his number retired in a ceremony here because, you know, he’s not retired. Frank is an all time great 49er. He’s going on 49er fans top 5 list of favorite players of all time. People may have loved Deion when he was here in 94, but he was a villain before and a villain after. No one knows if they will officially retire it but often it takes a number of years before someone is allowed to don the jersey of a niner legend. For example, Bryant Young retired in 2007 and that jersey was off limits for 10 years… I would imagine if they don’t officially retire it Frank Gore’s jersey will be similarly honored. Dion Sanders was nothing more than a hired gun. Gore bled for the 49ers. Sorry, but this comparison doesn’t hold water. Sanders had to be hired to neutralize Irvin, because we had no answer for him. Yup, Sanders was an elite mercenary. Did Dion get Eric Wright’ permission? he works for a friend of mine……… who is a Cowboys fan- I reminded my friend that Wright saved the NFC Championship (Catch) game w his tackle that tore the WR’s jersey (maybe Pearson). Niners should trade Mostert for Frank Gore. You think Frank will play special teams if asked? Mostert’s gunner expertise Trumps Gore’s sentimental journey. Trump is a trigger and fits in nicely with the hired gun metaphor by AES. They signed Mayo, who is a good ST player. Frank Gore should be used judiciously. You have to dress 46, at least 11 going on ST. I don’t know of any other player who has represented the heart and soul of the 49ers Organization in this century more than Frank Gore. I think he’s shoulder to shoulder with Gore on this one buddy. Yes, he’s in the convo, but Gore nudges him out, imo. Gore nudges him because it takes more heart to take hits than deliver them. #2 Joey Bosa. DE. Doesn’t matter if he’s one of or in fact the best pass rusher in the draft. The Bosas have been raised or trained to put the player before the team. Not the kind of player that is going to make sacrifices for the sake of winning. Not the kind of player I want on my teams but it’s definitely the type of player that Lynch wold draft. #36 Greedy Williams. CB. Williams is being grossly overrated and now even more so because of his fast combine time. Williams is best suited for a man coverage system, not what the 49ers tend to run. The CB group is a mixed bunch this year and because of that Williams is being touted much higher then he would in most other drafts. He’ll be a wasted pick for anyone that takes him before the 4th or 5th round which is why he’s perfect for Lynch and Shanahan as their 2nd pick. #67 N’Keal Harry WR. The next Laquon Treadwell. Not explosive or twitchy. Doesn’t get out of his breaks quick enough. Will probably be out of the league before his second contract. #104 Deionte Thompson S. DT is the perfect prospect for the 49ers. Not only did he have a terrible past season that took him from being considered the top S to a mid round prospect but he also has some pretty large character red flags. I wouldn’t be surprised if Lynch doesn’t trade up to draft Thompson. #176 Alex Bars OG. Bars missed last season with an ACL injury. Guard is also one of the more important positions to address in the draft so taking one this late is perfect for this organization. The fact that he is rehabbing means he’s a 49er for sure. #212 Jack Bailey P. Why not, probably can have him as an UDFA but he comes from Lynch’s alma matter. Sorry I didn’t proofread better before my 5 minutes was up. CFC – I haven’t written anything about who to eschew at number two but your comments about Bosa captured my thoughts perfectly. Thank you. If Greedy, projected top 10/15 pick, is there at 36, I would be very upset if the Niners didn’t take him. He can’t be worse than Witherspoon and Moore. This is so good. Bravo. -Bosa is a possibility, but the team could just as easily go with Allen, Williams, or a trade down. Practically everything else you wrote about Bosa is borderline crap. – The only ones who are overreacting to Williams are the ones who did not pay attention to the fact that it was well-known that he was going to run fast. If Woods think Williams can be coached up, then the 49ers might take Williams if he falls that far. Big if though. – Shanahan places separation at a high level of importance in his WRs, so any fan selection of a WR that doesn’t fit that criteria is fan speak or someone showing their level of intelligence or hate for the current staff. – Thompson is expected to go higher than the fourth round, so acquiring him at the low cost of a fourth round would essentially be considered a steal. Your attempt to make Shanahan and Lynch look bad actually results in them looking good. – Pass rush, safety, wide receiver, cornerback, backup TE, and SAM all easily trump the fans’ belief that another guard is needed. – The signing of Vogel negates the need to draft a punter. This is so good. Bravo! Since many think Bosa is the best pass rusher in the draft, Gruden and Mayock may want him.The Niners should let the Raiders have the second pick, in exchange for the numbers 4, 35 and 104th picks, along with a 2020 third round pick to balance out the Trade Value. 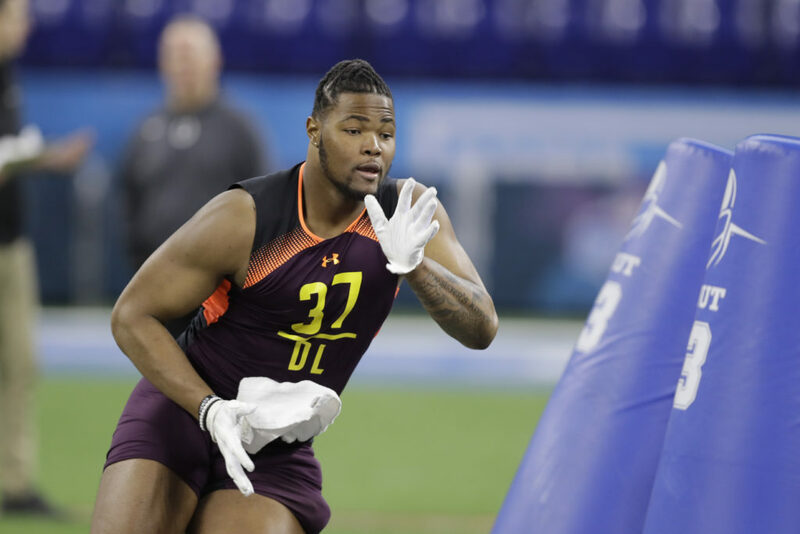 Niners need more draft picks, and the Raiders get their man, while still retaining their other 2 first round picks.With that number 4 pick, the Niners could select Rashan Gary, who is not only a good pass rusher, he is stout against the run. Many complain Gary is not accomplished, but he is a physical freak, and could dominate in the NFL with proper coaching and in the right scheme. With that Raider second round pick, the Niners could select an O lineman, DB or WR, who could become a starter. With the number 4 pick, the Niners could also take Q Williams, Josh Allen, Montez Sweat, Ed Oliver or Clelin Ferrell. Missing out on Bosa is not the end of the world, because he may not have red flags, but there are a couple yellow flags, like his hold out potential and injury history. Bailing out on his team is another concern. Trading back a couple spots to gain picks, while still getting the player they covet, is a sound draft strategy. Maybe Niners can fleece the Raiders, and with those picks, get themselves Allen, the best player available in the draft, and still address other needs. If the Niners want to fleece the Raiders, they would insist on pick numbers 4 and 24, both first round picks, along with the Raiders 4th round pick. I wouldn’t sleep on Brian Burns. This guy has all the physical tools to be a top pass rusher. Burns is the closest player coming out that reminds me of Aldon Smith. He would need to put on more weight and muscle to go up against NFL Olinemen, but when I watch him play, I see a young Aldon. But a possible pick in a trade down scenario? Absolutely. Hell yeah, 3rd degree Burns has been my #2 after Bosa all along during the Josh Allen band wagon ride. For the record I was on the Allen “bandwagon” before the “experts” were moving him up. Washington trades #15, #76 and their 2020 first and third round picks for #2. The 49ers select Cody Ford at #15. When the Redskins traded up to the #2 pick in the 2012 draft for RG3, they gave the Rams the #6 and #39 picks in 2012 and their #1 pick in the 2013 & 2014 draft. That’s where the 49ers should start if teams are trying to trade up for Kyler Murray. If they are trading up for one of the Edge Rushers then the 49ers should still get multiple 1st round picks. I would target a team expected to be terrible and try to see if the 49ers might luck into the 1st pick in 2020 for Justin Hebert or the 1st pick in the 2021 draft in order to get Trevor Lawrence. They say this is a weak QB class, so even I would not consider so many first round picks for a QB. Believe me, every team is thinking about Tua and Herbert next season, so they will not want to tank, with no first round pick. It may be a weak QB class but it only takes one team to want to trade up for Kyler Murray. Dolphins and Redskins may make great trade partners. Baker Mayfield’s success last year with the Browns paves the way for Murray to be highly sought after in this draft. Murray actually had better passing and rushing numbers than Mayfield out of the same offense. AZ may take Murray but if he’s sitting there at #2, I can definitely see teams making aggressive offers to move up in the draft. Cards are taking Murray, because Rosen did not shine. They say Miami is tanking for Tua. They will keep their first round pick for 2020. Redskins got Keenum. They actually won a game with Josh Johnson, so they have a strong team, and will not give away the store for a QB. The Skins will sit back, and hope Jones or Lock make it to 15. Stidham, Finley, Grier, Jackson and Thorson may also be later round prospects they would consider. I find Rypien the most interesting late round qb prospect due to his impeccable mechanics. Washington may like the family connection to Rypien, too. Mark Rypien was a 2 time SB champion, and SB MVP for the Skins. Sebbers, not sure Snyder is astute enough to realize Rypien would fit Gruden’s system perfectly. I think Snyder is waiting for the Vikings to send Cousins back. ‘Kurt’ does not think so…..
I’m starting to really dislike all 3 of those guys. I say trade back for loot! I’ll be happy with Allen or Bosa. Williams? Not so much. I don’t think it’s the year to take another NT. I’ve got 16 bonafide 1st round picks in this draft, and so you do not want to trade down any further than Miami. Giants expressed their interest in obtaining the number 2 pick. Both the Jets and TB are trade up targets, and Gruden may also want Haskins. Since the Giants have 12 draft picks, including 2 first round picks, they have a ton of trade capital to work with. Giants could trade their first, second, fifth (6, 37, 143), and their 2020 second round picks for the Niners number 2 pick. That way, they could retain their first round, number 17 pick. Niners could stand pat and have the 36th and 37th picks in the second round, or trade one of those back again for even more picks. I am not being greedy, and insisting on the Giants 2 first round picks, because that might be a deal killer. This way, Giants are almost guaranteed Haskins, their QB of the future, while the Niners can still possibly get Sweat, Oliver, Gary or Ferrell. The Niners may miss out on Bosa Williams and Allen, but that second round pick will help them get an O lineman, DB or WR. The Niners also do not have a fifth round pick, so the Giants fifth would be a welcome addition. The Niners traded away their 2020 second round pick, so the Giants 2020 would replace that pick. It comes down to the Giants and Raiders on if they want Haskins. If the Giants want him, they’ll have to move ahead of the Raiders. That means either trading with the Jets or Niners. If they deal with the Jets, the Raiders could still make a trade with the Niners, so the Giants might be forced to go to number two to get Haskins. I don’t thin Gettelman wants to do that. He likes his picks and could get a prime defensive player, or an O-Lineman at six, then wait until later in the first round and grab someone like Daniel Jones, or later still in the 2nd/3rd on Will Grier or Ryan Lindley. But if Haskins is in play, the Niners need to be on speed dial. No chit Sherlock, Jay! The Cardinals are damned if they do, and damned if they don’t. Either they take Murray or trade the pick. Either way, we get Bosa. They don’t take Murray or trade, and we get a U-Haul of draft picks…. I hope they take Murray. He will never be a threat to SF in the years to come. Again I’m a huge Sooners fan. This kid will not get past the speed and difficulty of the NFL. I watched him look like a deer in the headlights when pressured with a good defensive scheme. Watch the Texas game. Alabama game. Not even a half bakers dozen. He will be a bust! I tend to agree, however there’s two things in his favor. 1. He’s got a coach who’s joined at the hip with him, and seemingly a perfect fit within his system. 2. He’s got a HOF receiver to lean on through the season. I’m not too familiar with his personality, but if he has more humility than RGMe; it can only bode well for his success rate…. I disagree, respectfully. Murray has a baseball background, like Russel Wilson, and Pat Mahomes. He is accurate, and his throws are quick, effortless and with touch. He was 207 lbs at the Combine, so he is developed enough muscle to withstand the sledgehammer blows. Murray is fast, elusive and mobile. He is a threat to score every time he touches the ball. He will run circles around 4.79 speed, and the rules nowadays protect the QB. Kingsbury loved Kyler Murray even before he became HC of the Cardinals. If he misses out on Murray, that may haunt him for the rest of Kingsbury’s life. He almost has to take him. I am resigned to having 2 mobile QBs, Wilson and Murray, in the division. Thankfully, the Niners have schemed how to stymie Wilson for years, so they will probably go like the Chargers did. and go 6 DBs, and blitz a safety. I don’t follow college football much at all and the draft only a little. However, I have followed the Niners since the mid 60’s and it is clear that a great pass rush is needed to succeed in the NFL. How many games this past year would have been won in the 4th quarter if the Niners could pressure the QB? I think it has been a big upgrade getting Ford, but I think they need another pass rusher. My question is who are the best 3 pass rushers in the draft? Who is most likely to give the team at least 10 sacks a year for the next 6-8 years? I really would like to know who the panel thinks can best fill that role. Allen, Ferguson and Sweat.Ferguson and Allen led College football in sacks, and Sweat is 6th. Williams, 21, chose IHOP. A man of simple tastes. Hey, we are talking Alabama here. That is fine dining there. Bad fuel and his tank was empty late in the championship game. Gonna have to learn to run on a more professional grade. True. Mass shootings no extra charge. In other words, will Williams remain an IHOP man when he can afford Ruth’s Chris? Ruth Chris? Meh, another mediocre chain. Let’s see him as a regular at the South Bay Alexanders. South Bay Alexanders? Meh, let’s see him as a regular at Paul Bunyan’s Cupboard. Looks like a cool place. For those Packers away games? Is that Wisconsin Dells location near House on the Rock? Ribico, I was being facetious when referencing Paul Bunyan’s Cupboard. It’s from the movie, The Great Outdoors where John Candy ate the ‘Ole 96er’. I haven’t been to the place you found, but I’d agree it looks cool. Don’t know about anyone else, but I’m kind of over debating pick #2! Even if you don’t like the player, I think most people can accept it will probably be Bosa if he is available. Most reports seem to indicate this. So what about pick #36? Who do people really want with this pick? At the moment I am thinking the following list of players (not including guys that have next to no chance of being available at the pick, and assuming Bosa is indeed the pick at #2): Hakeem Butler, Juan Thornhill or Chauncey Gardner-Johnson. If none of those guys are available, trade back. As much as I like Deebo Samuel and Nasir Adderley, I would trade back before taking them at #36. I’ve excluded OL from that list even though I think there will be some really good ones available and an OL should be considered. I just don’t think the 49ers will take an OL on day 2 anymore. I think it will be Safety and WR day 2. I think bang for your Bosa, you pair the #2 pick with a FS. Like WR, I think it too is a sweet spot for the position. I also don’t think in the 3rd round you’ll have as many choices at FS as you will WR. Adderley – Reminds me too much of Ward. Size, school and durability. Thompson – Boom or bust. Slender. CGJ – Versatile but is SHS his natural position? Thornhill – He’s my pick of the litter, and I don’t feel #36 is too high. You could get cute and trade down a hair. Hall – The Missouri wr is a field stretcher with a limited route tree. McLaurin – Underutilized and a better route runner than Hall. If Ridley is gone, McLaurin would do nicely. Ridley – Could slide into the 3rd round due to poor 40, and would be my first choice due to fit at z.
Campbell- Boom or bust. Gadget piece and needs work as a wide receiver. Isabella – Slot or x but probably not physical enough for z. Looking at a Giants trade up scenario, with a realistic trade deal. Giants get to keep their 17th pick. They give up a first, second and fifth round pick (6, 37, 143), plus a 2020 second round pick for the Niners number 2. The 2020 second round pick balances out if the Giants pick 11th next season. The Niners would end up with pick numbers 6, 36, 37, 67, 104, 143, 176 212. In the second round, the Niners then trade back with Atlanta 8 spots. Falcons want to move up to draft a defensive lineman, or one of 3 safeties out of range at 45. Falcons give up their second, 4th and fifth round (45, 117, 152) picks, for the Niners’ pick number 37. It balances out in the TVC. With that trade back, the Niners end up with pick numbers 6, 36, 45, 67, 104, 117, 143, 152, 176, 212. Ten picks in all. Six picks in the first 117 picks. 8 picks in the first 152nd. Foster Moreau is ranked 117, Jalen Jelkes is 113, Caleb Wilson is 111, Oshane Ximines is 108, and Deebo Samuel is 106, so good players have lasted until the middle of round 4. I think starters can be found around 60th in the rankings, with Germaine Pratt, ILB, Kaleb McGary OL, Andy isabella WR, David Montgomery RB, Cody Ford OL, Jaylon Ferguson, and Rock Ya-Sin CB, all available. I think there is first round talent even at 39 (C Gardner Johnson S).